Scanner usually wears a black suit and tie. He seems uncomfortable at the best of times, and nervous or irritable the rest of the time. Scanner is uncomfortable around other people, and prefers to be alone. He isn’t deliberately unpleasant, but he finds the dichotomy between what other people think and what they say almost physically painful. He is more likely to reply to what people are thinking at him rather than to what they have said. Most of the time, this makes his behaviour socially unacceptable. Individualism: The character believes that the rights of the individual hold the highest moral value. Uncontrolled Power: Scanner is unable to completely block out the thoughts of those around him. Ryan never fit in with the other children. He always seemed strange and aloof, and he seemed to like it that way. It was not until he was in his early teens that his telepathic abilities began to surface. Disturbed by the “voices” Ryan said he heard, his parents had him committed to a mental institution for treatment. He was freed from this institution a decade later when two posthumans broke into the facility to rescue another patient. Since then, Scanner has been on the run and on his own. Scanner is one of the most powerful telepaths on earth. 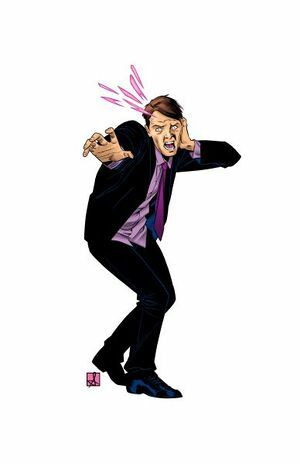 He also has a variety of other mental abilities, but these are not as potent as his telepathic abilities. Unfortunately, he does not have complete control over his telepathy. He is unable to completely screen out others’ thoughts, making it uncomfortable for him to be near crowds. This page was last modified on 5 December 2014, at 10:01.